Portland’s Blitzen Trapper runs six deep when it comes to town, but the rambling Americana heart of this rather eclectic band is singer and songwriter Eric Earley. When 2007’s self-released Wild Mountain Nation dropped, the album was praised for its glut of good ideas—a wildly varying amalgam of Pavement slouch, hard-rock riffage, Southern hoedown, and Beck-like pop weirdness. Earley himself is almost as colorful, though coolly composed, which is actually a near-perfect way to describe Blitzen’s most recent album, Furr. The consistency of the band’s musical soup seems to thicken with time, and Furr finds Earley honing both that and a Dylan-esque lyricism. In advance of Blitzen Trapper’s performance tonight at the Bluebird Theater, Earley spoke to Decider about his next record and biting Mr. Zimmerman’s steez. Decider: Your music, in sound and subject matter, has a distinct Americana bent. Do you attribute that to the influence of your father, a bluegrass musician? 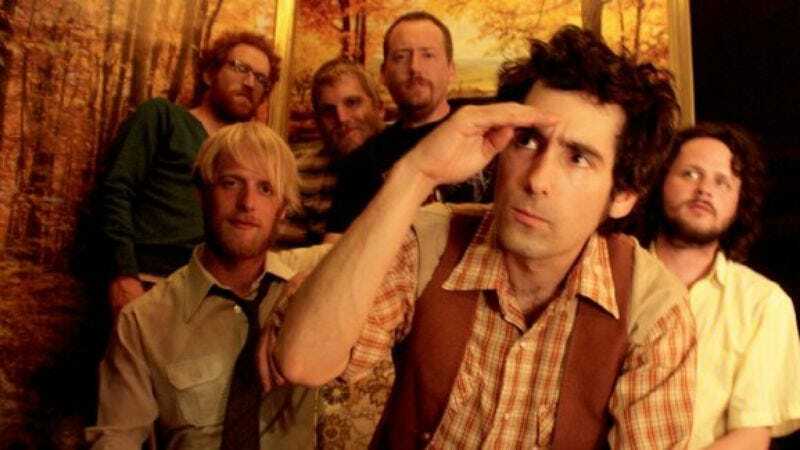 D: Moreover, Blitzen Trapper seems to represent a broader, classic American-ness. Is that something you see as being part of the band’s identity? D: What you can say about the sound of the next record? D: Was that musical consistency something that you sought out? D: You’ve said that “Black River Killer” was inspired, in part, by the work of Cormac McCarthy. Does literature have a heavy influence on your songwriting? D: Your lyrics and delivery often draw Bob Dylan comparisons. Is it fair to say he’s chief among your musical influences? D: Is there something that you get from Young that you don’t get from Dylan? D: You’ve mentioned a slightly less obvious stylistic influence on the sound of Furr. What was that?